This portal is manually maintained. This portal needs updating with new content. Food is any substance consumed to provide nutritional support for an organism. 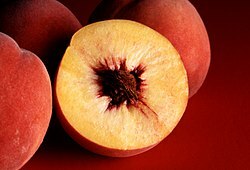 It is usually of plant or animal origin, and contains essential nutrients, such as carbohydrates, fats, proteins, vitamins, or minerals. The substance is ingested by an organism and assimilated by the organism's cells to provide energy, maintain life, or stimulate growth. Historically, humans secured food through two methods: hunting and gathering and agriculture. Today, the majority of the food energy required by the ever increasing population of the world is supplied by the food industry. Maize /ˈmeɪz/ (Zea mays L. ssp. mays) is a cereal grain that was domesticated in Mesoamerica and then spread throughout the American continents. Maize spread to the rest of the world after European contact with the Americas in the late 15th century and early 16th century. 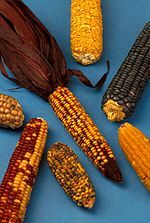 The term maize derives from the Spanish form (maíz) of the Arawak Native American term for the plant. However, it is commonly called corn in the United States, Canada and Australia. Corn is a shortened form of "Indian corn", i.e. the Indian grain. The English word "corn" originally referred to a granular particle, most commonly cereal grains. Hybrid maize is preferred by farmers over conventional varieties for its high grain yield, due to heterosis ("hybrid vigour"). Maize is the largest crop in all of the Americas (270 million metric tons annually in the U.S. alone). While some maize varieties grow 7 metres (23 ft) tall at certain locations, commercial maize has been bred for a height of 2.5 metres (8 ft). Sweet corn is usually shorter than field-corn varieties. Georges Auguste Escoffier was a French chef, restaurateur and culinary writer who popularized and updated traditional French cooking methods. He is a near-legendary figure among chefs and gourmets, and was one of the most important leaders in the development of modern French cuisine. Much of Escoffier's technique was based on that of Antoine Carême, one of the codifiers of French Haute cuisine, but Escoffier's achievement was to simplify and modernize Carême's elaborate and ornate style. Alongside the recipes he recorded and invented, another of Escoffier's contributions to cooking was to elevate it to the status of a respected profession, and to introduce discipline and sobriety where before there had been disorder and drunkenness. He organized his kitchens by the brigade system, with each section run by a chef de partie. He also replaced the practice of service à la française (serving all dishes at once) with service à la russe (serving each dish in the order printed on the menu). San Francisco Sourdough bread differs from other sourdough bread in being leavened with a culture prepared with fresh grapes. The multiplicity of strains of yeast (up to 16 according to the work of Robert K. Mortimer, professor emeritus of Molecular and Cell Biology at U.C., Berkeley) produces a unique taste. Dough (Pâte in French, Pasta in Italian) is a paste made out of the flour of any cereal (grain) or leguminous food, moistened and kneaded but not baked. This step is a precursor to its use in cooking in numerous ways such as making bread, pasta, noodles, pastry, cookies and muffins among other uses. Dough differs from batter in having a lower water content. ...that during the Middle Ages whale, dolphin and porpoise were considered to be fish, so during Lent the salted meats of these sea mammals were eaten. ...that in Ayurvedic medicine, turmeric is thought to have many medicinal properties and many in India use it as a readily available antiseptic for cuts and burns? Whenever there is a cut or a bruise, the home remedy is to reach for turmeric powder. Ayurvedic doctors say it has fluoride which is essential for teeth. It is also used as an antibacterial agent. ...that In the 19th century, the chef Antonin Carême classified sauces into four families, each of which was based on a mother sauce? ...that the traditional four finger version of the Kit Kat bar was developed after a worker at the Rowntrees factory in York put a suggestion in the suggestion box for a snack that a 'man could have in his lunch box for work'.? ...that cheddar cheese is the most popular cheese in the UK, accounting for just over 50% of the country's £1.9 billion annual cheese market? The following are categories relating to food.